Mike, Darren, rex, Vanessa, and Matt. Photo by Paco Gasco. As previously reported, the lot of us are in Bonn for the sauropod biology workshop. 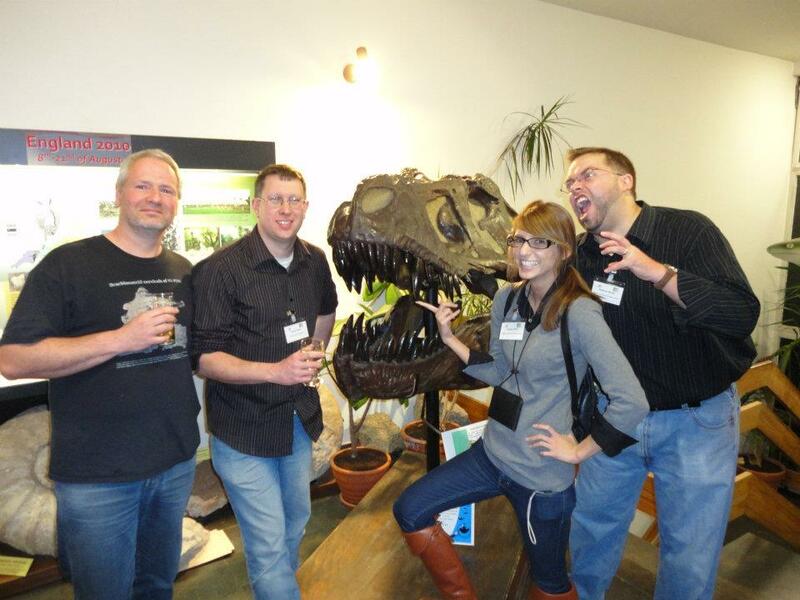 Last night we met up at the welcome reception at the Goldfuss Museum. It was the first time for Mike and Darren to meet Vanessa Graff and Paco Gasco in person, and of course we all got to meet people we didn’t know previously who are here for the workshop. There is an outstanding series of talks lined up. Three days with some of the world’s best workers talking about sauropods all the time? Yeah, I reckon we can handle that. No sauropods in the Goldfuss Museum, so we naturally hung out the biggest saurischian around (even if it is a vulgar, overstudied theropod). This and any future posts for the next few days will necessarily be brief; gotta go learn about sauropods!